If Old McLightlife had a farm, all the pigs would be made of vegetables. 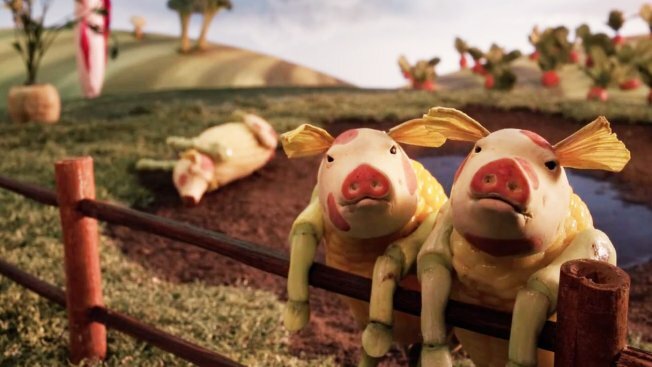 Lightlife, a ConAgra purveyor of meatless foods, launched this stop-motion animated online ad last week from Venables Bell & Partners imagining a fairy-tale plot of land where all the livestock have been replaced with versions of themselves constructed entirely out of edible flora. Set to a takeoff on “Old McDonald Had a Farm,” the spot, directed by Kirk Kelley of LAIKA House, paints a picture of a place that, depending on the viewer’s diet, will seem either like a form of heaven or of hell—an environmentally friendly, slaughterless paradise for vegetarians, or a torturous existential prison for meat lovers. The rendition of the classic nursery song is charmingly enthusiastic but also a little grating. Also, the lyrics aren’t always as easy to make out as they probably should be. Still, they succeed in painting an overall picture of an earth-and-animal-loving ethos that’s sure to resonate with the hard-core element of the brand’s target, and alienate some of the people who would never buy its products anyway. It’s certainly attention-grabbing, having already racked up more than 1.5 million YouTube views since Sept. 17, with the comments there so far bringing out trolls happy to rant from both sides of the meat-eating issue. Regardless, it’s safe to say Nick Offerman would not approve.